An evening exploring the Spanish-speaking Jewish world, rooftop Havdalah, pop-up art exhibits, storytelling workshops, and organic cooking classes are just the beginning! From Venice Beach to Echo Park, NuRoots mobilizes people in their 20s and 30s to build meaningful communities across Los Angeles. 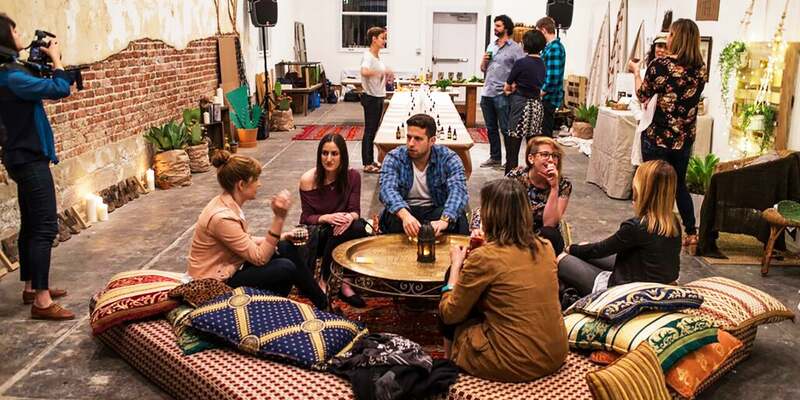 In collaboration with community members and inspired by Jewish culture, heritage, wisdom, and values, NuRoots brings people together to reimagine Jewish life through creative experiences and gatherings of various sizes. Somewhere in Los Angeles, nearly every week, there’s a NuRoots experience going down. Taste exotic Jewish foods at a delicious Shabbat dinner. Reflect and recharge with an evening of guided meditation during the High Holidays. Spend an evening sampling different flavors of challah or join us for a live show, a movie screening, Jewish yoga, or an herbal mixology class! The list goes on, and on, and on! Or, maybe you want to celebrate a holiday like Chanukah or Passover through one of our city-wide festivals. Whatever your curiosities, there are nearly a hundred different opportunities to try new things and meet new people. Looking for something more personalized or intimate? NuRoots Fellows are energetic community weavers, meeting people where they are – geographically & demographically – across Los Angeles and working with the community to curate intimate and unique Jewish experiences, right in your own backyard (sometimes figuratively – sometimes literally!). We have Fellows working in the Valley, the Eastside, and the Westside/Intergenerational; and with the Persian, Russian-speaking, and young couples communities. NuRoots was built to thrive on real conversations and experiences, and we want to meet you – wherever you are! From the Venice Boardwalk to Sunset Junction, the 818 to DTLA, and collectives devoted to young couples and intergenerational spaces, The NuRoots Team is excited to get to know you and help you create new ways to experience Jewish life in LA.